One fine day during my years at engineering school I was walking down the stairs between two floors in the chemistry building. Bang! It sounded like a gunshot, and close at hand. I was alone in the stairwell, and a quick inventory showed no punctures, so I shrugged it off and continued down the stairs. Just one of those things…. A few steps later, bang! By the time I reached the landing, there had been two additional loud reports. It's then that I noticed there were dark splotchy purple-red stains on some of the stairs. I went back up a couple of stairs and deliberately stepped on one: bang, and a purple cloud shot from around my shoe and started to disperse. 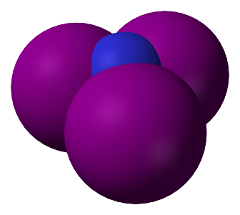 In nitrogen triiodide, due to the structure of the electron shells of nitrogen, the three iodine atoms all bond to one side of the nitrogen atom. Since the iodine atoms are about twice the size of the nitrogen, they don't “fit” well in the limited space, and this creates what is called “steric strain”: the iodine atoms repel one another and thus are only very loosely bonded to the central atom of nitrogen. This is a high energy configuration, whose energy can be dramatically reduced by rearranging the atoms in a sample of NI3 so that nitrogen atoms are bonded to one another to form nitrogen gas (N2) and elemental iodine. This leaves lots of left-over energy, whence the bang. The cloud of purple is iodine escaping from the reaction. NI3 is just barely stable. If kept isolated from all forms of disturbance, it will remain in that form, but the application of only a tiny amount of activation energy of almost any kind will cause some molecules to break down, releasing energy which will trigger the breakdown of adjacent molecules in a chain reaction until the entire sample has detonated. The detonation proceeds at the speed of sound in the material, which is on the order of 3 kilometers per second. So small is the activation energy that NI3 can be detonated by just about anything: being tickled by a feather, the impact of balloon, an air current, an insect landing on it, or a loud noise. It can even be set off by an alpha particle emitted by a radiation source—it is the only explosive known to be this sensitive. In practice, in the real world, sometimes it just blows up and you're not sure why. I can assure you that my size 45 clodhopper landing on it will get the job done. When NI3 is synthesised, it precipitates out from the ammonium hydroxide solution and can be separated by filtration. It will initially be kept wet by the solution and, while wet, is relatively stable, especially if kept cold and in the dark (but that's “relatively”: with this stuff you never know). It's only when it dries out that it becomes hyper-sensitive, so pranksters can mix up a batch and then pour it out, say on the steps of a staircase, then leave it to dry to await an unsuspecting victim. NI3 has no practical applications whatsoever. It is so sensitive that it will always blow up before you intend it to. Once it dries, you can't even move it without it going blooie! To be useful, an explosive has to have an activation energy sufficiently high that it can only be set off by a stimulus you can control, such as the firing pin of a firearm, heat, or electricity. There is no risk of terrorists using NI3 because anybody who made it in sufficient quantities to do serious damage would succeed only in blowing themselves up: those who do so are humorous, not terrible. This is good because the stuff is very easy to make, and when I was a kid you could buy the ingredients at most pharmacies (pro tip—don't ask for both at the same time; old-time pharmacists have seen it all), and they're available in almost any inorganic chemistry lab. I don't recommend you fool with the stuff, however. Enjoy the videos of those who take proper precautions to demonstrate it safely. I've never been superstitious about stepping on or avoiding cracks in sidewalks, but ever since that day I've been suspicious of red-purple stains, especially when visiting college campuses. (Now I'm going to go into some chemical detail to avoid quibbles. If you're not interested in such, skip ahead to the videos at the end.) There's an additional bit of sloppy terminology associated with nitrogen triiodide. When one makes what is called “nitrogen triiodide” from iodine and ammonium hydroxide, what is actually produced is an adduct of NI3 and ammonia which is written [NI3 · NH3]. The presence of ammonia raises the sublimation point of the substance. The adduct was discovered in 1812, and is usually called just “nitrogen triiodide” because it is that component which gives it its bang. Pure NI3 was only synthesised in 1990 by a route not involving ammonia. It sublimes to a gas at a temperature of −20° C and spontaneously decomposes at 0° C, often blowing up. Little is known of its physical and chemical properties because it is difficult to study a substance that explodes whenever you try to do an experiment with it, and because modern chemists are fond of their fingers and eyes. Here are two videos by The Royal Institution demonstrating detonation of NI3 and discussing why it is so unstable. This video shows the preparation and detonation of NI3.